Dental implants are always marketed as something which mimics the structure of natural teeth. Is this something which really matters, though? In short, yes it does. You can’t use a dental implant which doesn’t mimic the shape and size of a natural tooth. This is for biological reasons and for health reasons. If you tried to use one which didn’t have the same size and shape you would have to return to the dentist every few weeks. When someone refers to a dental implant as something natural what they’re really referring to is what’s underneath the implant. 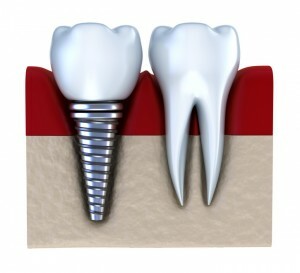 A titanium implant, for example, has a piece of titanium extending out from under the visible part of the tooth. It’s fused into the bone so it remains stable. Every implant must be aligned with the bone correctly. This is what prolongs its lifespan and makes sure it can continue to function for years to come. It’s also important for alignment reasons. The human body is wonderful because everything is engineered to be perfect. If a tooth is even slightly out of alignment you can’t chew correctly. Each time you chew on your food it will feel strange. A perfectly aligned implant will feel the same as a natural tooth. We must also consider what a dental implant is supposed to do. It’s designed to increase your confidence by filling a void in your mouth. Many people can’t bear the thought of going outside with a missing tooth. An implant which isn’t exactly in the right place will be noticeable. This is just as bad as not having any sort of implant at all. Think about how easy it is to spot when someone has a tooth which is slightly bent out of shape. You can see it as soon as they open their mouths. The same thing applies to a dental implant. If it’s slightly out of position everyone will be able to see it. This detracts from any benefits you had in the first place. What about Your Other Teeth? You might not think your other teeth come into play. The jaw bone supports every tooth in your mouth. It puts the correct amount of pressure on each tooth. If these pressure weightings change some teeth will become damaged. Early implants had this problem. They put a lot of pressure on other teeth because they failed to carry their own weight. The modern implants of today fuse into the mouth and support themselves. This is why it’s important for them to be natural. There’s no additional pressure on surrounding teeth, so you shouldn’t expect to experience any further oral health problems in the coming months and years. To make it seem as natural as possible, dental engineers dye the real enamel to match the slightly off-white color of a natural tooth. They also create the grooves and various impressions of normal teeth to ensure they match the natural shape of your original tooth. Whilst the materials used in the making of normal teeth aren’t as durable as natural teeth, the porcelain will last for at least a decade before it needs further maintenance. The author, Beth Louis, is a healthcare professional and a successful writer. She has written many research pieces in various medical journals across the globe. She requests her readers to sought help of professional teeth whitening dentist rather than going to someone who lacks that particular skill.